Before my Journey To The West to spend the Chinese new year in mother Blighty, I saw an odd thing at the South gate of my university, Tsinghua. It was early evening, the same time I always leave the library and board the homewards sardine bus 307, usually by way of a piping hot jianbing from the talkative street-food vendor Hua shifu – Master Flower (her surname). But this time – standing at the foot of the overpass which leads to 307 – there was a new element to the picture. A fifty/sixty-something lady with sad wrinkles, clutching a wad of sheets, pressing them into the hands of passerbys who would either reject or take and drop into the next bin – or on the street (this is China). It was a sad enough sight that I took one of her without even a jianbing pit-stop. I glanced over the sheet on the bus, and wished I’d stopped to talk to the sad looking lady. It wasn’t an advert – my assumption – but a petition, a plea for justice for her daughter or granddaughter (hard to guess). I didn’t get more than the gist then – the Chinese was written in a flowery and overly rhetorical style, as you will see – but here I am in my Oxford home, with a dictionary at hand and a free morning. We are from Ziyang in Sichuan, we came to Beijing from a thousand miles far away, with the single purpose of demanding justice for our daughter. The injustice in question is that their daughter Chen Xiaoyan “is a current graduate student at Beijing Foreign Languages College. At the beginning of 2008 she took the examination to a Masters program at Beida.” But the Japanese listening section was missing 20 questions, and even the supervisor was “at a loss for what to do”. As a result, Xiaoyan only got 43 marks in that section (50 is the lowest pass mark). Despite good performance in other sections, Beida didn’t take her. ä»ŽåŽ»å¹´åˆ°ä»Šå¹´ï¼Œæˆ‘ä»¬å…¨å®¶ä¸€ç›´ç”Ÿæ´»åœ¨æ°´ç”Ÿç«çƒ­ä¸­ï¼Œä¸ºè®¨å…¬é“å®¶ä¸­ç§¯è“„èŠ±å…‰ï¼Œç²¾ç¥žé­å—å´©æºƒè¯•çš„æ‰“å‡»ï¼Œçˆ¶æ¯å­å¥³æ— ä¸å¿§è™‘ï¼Œé£Žé¤éœ²å®¿ï¼Œç”Ÿæ­»ä¸é¡¾ã€‚From last year  to this year, all our family has constantly lived through fire and water, to demand justice we’ve used up all our family savings, our nerves have been subjected to crumbling blows, the whole family is anxious, we’ve endured arduous hardships [lit. to eat the wind and sleep in the dew], not caring what the cost is. 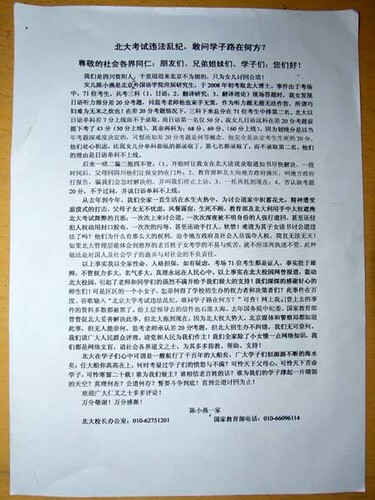 If the management of Beida can [only] appreciate the difficulty and suffering of the exam-taking sons and daughters of the simple, honest common folk [lit. laobaixing, the ‘Old Hundred Names’] there will never again be such obstinate refusal to care. This kind of practice makes a mockery of fellow countrymen and our society’s students, and lacks responsibility to society. We ask the masses to judge which side is right, we ask the Party and the People to support us! Our whole family, except for our little daughter who has some knowledge of the internet, are all internet illiterate, we ask those learned in morality from all walks of life, to give us plentiful advice, help and support on this matter! Beida in the hearts of students, it can be said, is a ship which has sailed for thousands of hundreds of years, with vast numbers of students as the steady flow of water*. How can this big ship be aloof and superior, when examinees’ feel indignation and dissatisfaction? All the pitiable hearts of parents under heaven [tianxia, a common – if classical – Chinese phrase], all the pitiable suffering lives of students, all the cold windows of twenty years**! Who will back us up? Who will believe the words of the laobaixing? Who will hold up a cloudless sky for our students? Where is the truth? Does justice exist? We must swear to fight on to the end! We will stop only when the demands of justice are met! I won’t comment except to mention that Beida is plagued by accusations of admissions inequality, of which a missing set of exams questions is I imagine just an anomaly. More pressing, I’d venture, are the wildly imbalanced quotas of students to accept from provinces and municipalities with varying populations – discrimation according to birthplace. But it all shows up the problems in the system, or more to the point here, the indifference in the appeals process. And please no one say ‘but China is so big’. Finally, good luck to family Chen is the go-get-’em year of the tiger! * to Chinese speakers: if there’s a less cumbersome way of translating that, please tell me! And am I right in thinking that this is a really odd metaphor even in the original? ** ditto. Update: other and better translators have suggested for this “a long and arduous period of study” and “burning the midnight oil”. 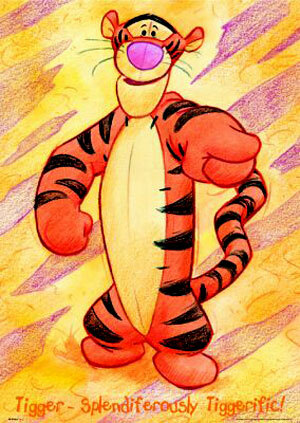 A little late, but all the heartier for it … happy year of the tigger! Here’s a little present for this Valentine’s day Chinese new year: Taiwanese soldiers shooting Cupid’s Arrows, and a response from the wannabe recipients of that love. A soft offensive across the straits? Both in Chinese, but non-speakers will get the drift … (hat tip to my friend Zhide for putting me onto these). We are good at computer science right now, but we lost China 60 years ago. Final item of interest: your humble blogger is flying home tomorrow, to pass spring festival in England’s green and pleasant lands. I’ll be posting only sporadically from there, until I’m back in Beijing in March, when I will get back into the rhythm. Update: A gentleman also reads my comments on top tier higher education in China here on China Geeks. Charlie, China Geek of the moment, writes on the Chinese education system, and how it doesn’t encourage enough critical thinking and creativity.